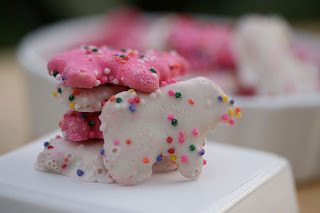 Pink, White, Sprinkles, and Elephants! You may recall my period of mourning for Mothers' cookies, makers of the legendary circus animals and other tasty treats, who filed for Chapter 11 Bankruptcy a few months ago. Now, I'm not here to condone ginormous corporations, but it appears as though Kellogg's has swooped in at the final hour in a heroic move to SAVE THE ANIMALS! They've acquired Mothers' trademarks and recipes. I hope they start making them soon.